Especially designed for 30% - 40% time savings in inventory process. Do you already have a smartphone? Great! No additional costs with new devices! 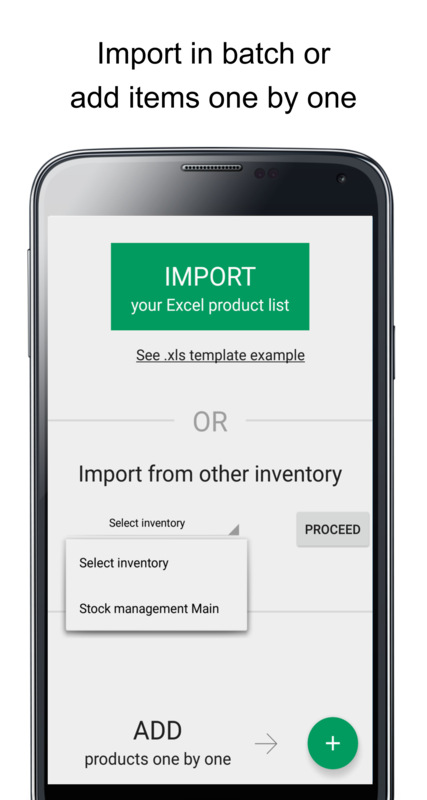 It's your decision how to do it: add products one by one, import from an excel / csv list or get the products from another inventory. 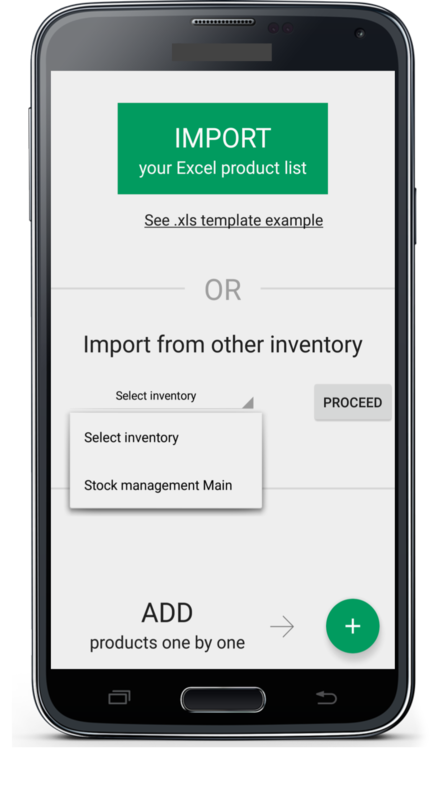 Beside products, inventory management needs entries to be added. In a very quick manner you can add inputs, outputs and movements between locations. Your inventory could have one or more locations to manage. 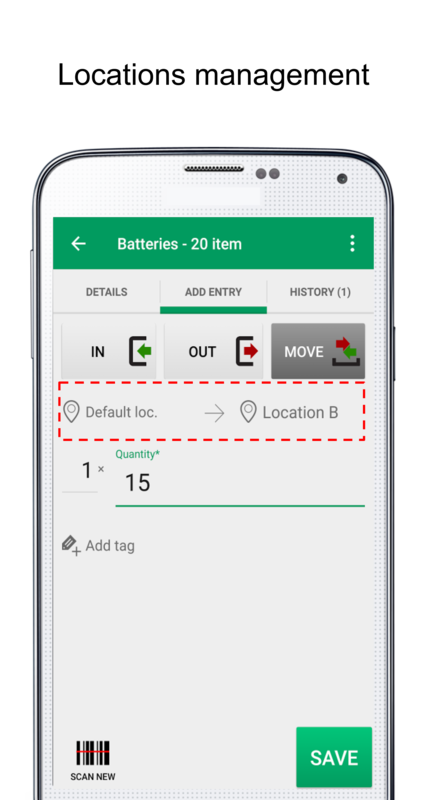 That why Mobile Inventory allows you to define locations, manage transactions and extract reports by location. Real time entries mean real time stocks ... Analyze the entries by using friendly tools: filters, sort, quick search, etc. 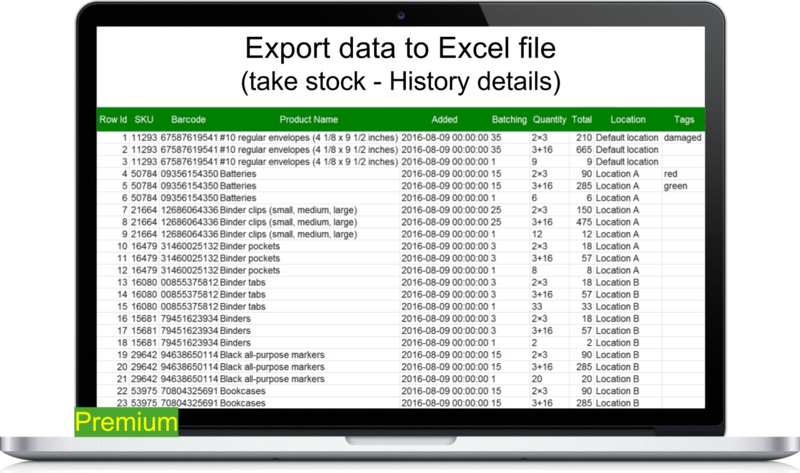 Populate products list by choosing from the alternatives: importing from a predefined Excel (.xls, .xlsx, .csv) product list, taking over from Stock management at a certain date, adding products manually one by one. 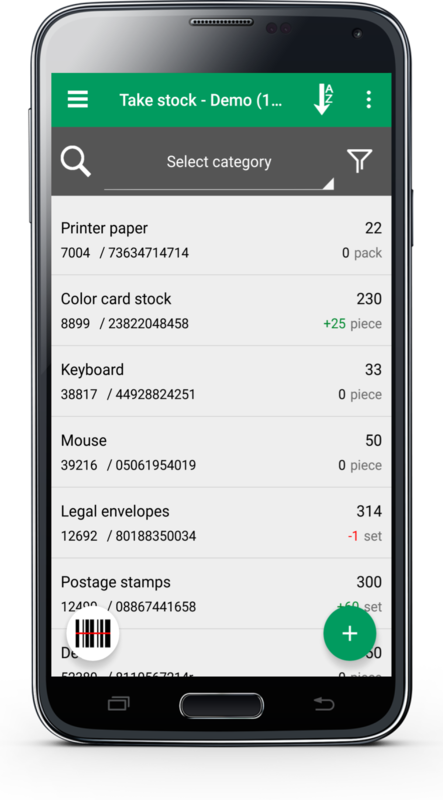 Add collected quantities by using: barcode scan, quick search, category filter, calculator, tags, counting history, batching factor. 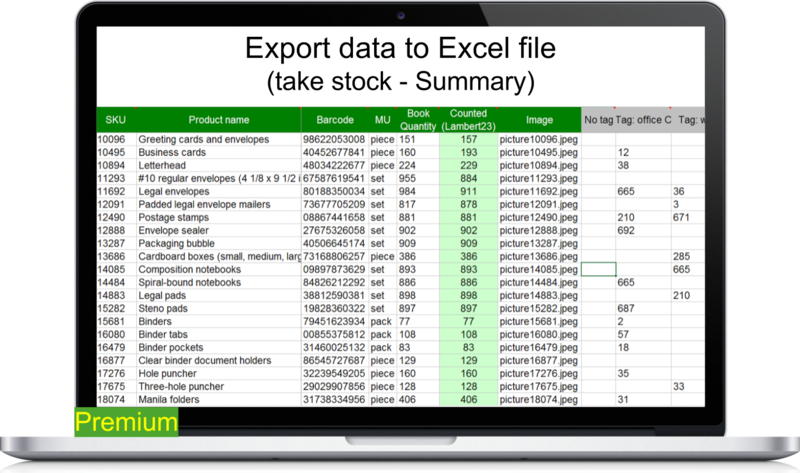 Capitalize your work and export inventory list in a .xls /.xlsx format file. 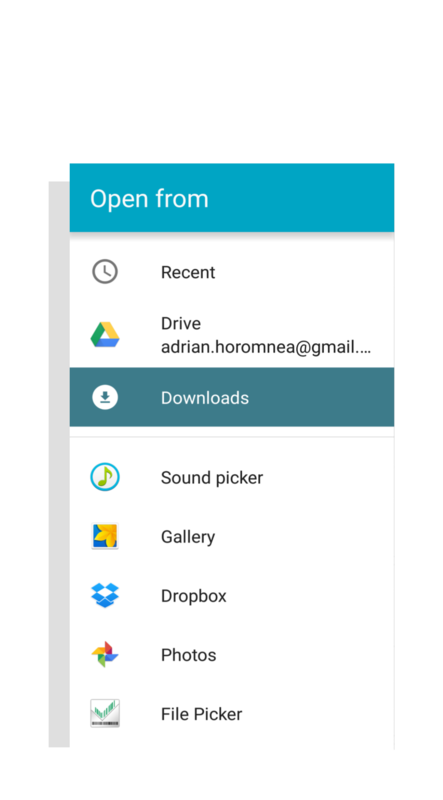 The exported list is especially designed for following matching processes and can be saved locally, on drive, shared via email, etc. 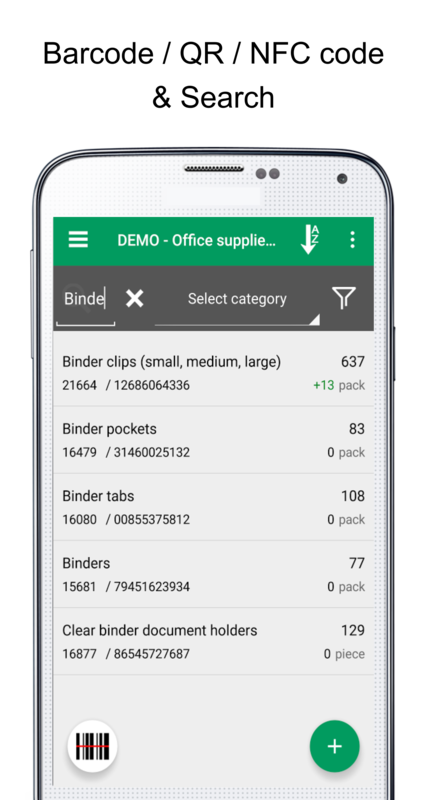 Predefine a products list in an Excel format file, bring it to the mobile device (via Drive, DropBox, Email, other transfer ways) and import it to the app. Products can be added one by one from app too. Just fill product identification fields and collect quantities! This is the right feature if your products are assigned with QR / Barcodes or NFC tags. You can scan product QR / Barcode with mobile device camera for a quick identifying in products range or for assigning QR / Barcode automatically to the products. 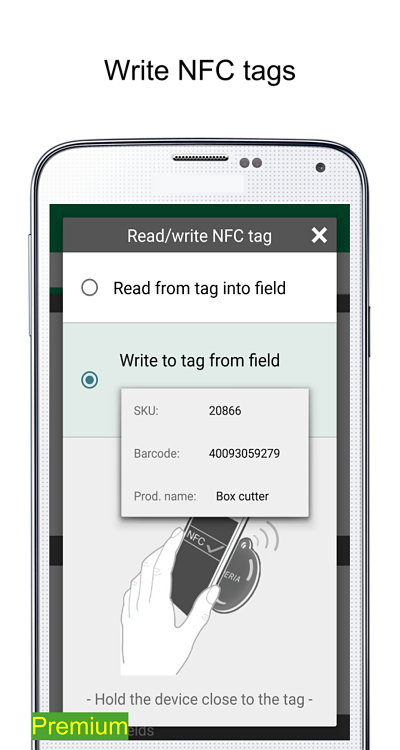 If your device has NFC reader you can identify products by placing it in the vicinity of the NFC tag. Search is an excellent tool for identifying the wanted product from the inventory list. By typing the right keywords your products list collapses to the matched items. In a very quick manner you can add inputs, outputs and movements between locations. 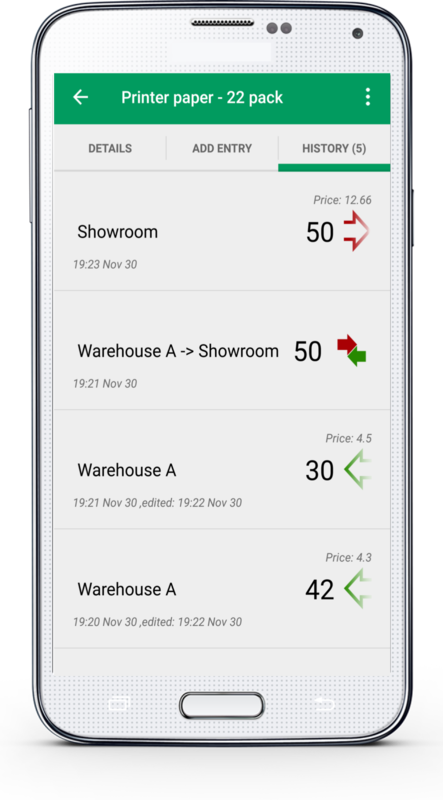 Each entry is associated to a product and a location so you can manage easily your inventory. Multiple inventory locations could fit to your case. 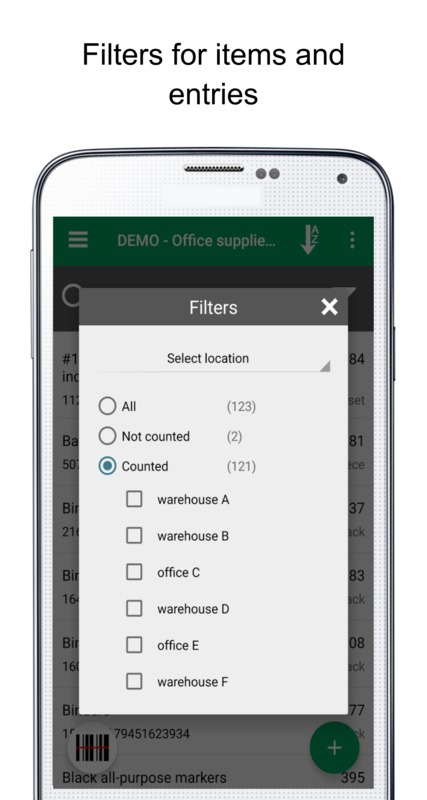 Mobile Inventory allows you to define locations, manage transactions and extract reports by location. Any entry can be easily identified in entries list because of the filter and sort features. Once identified you can edit or delete it. 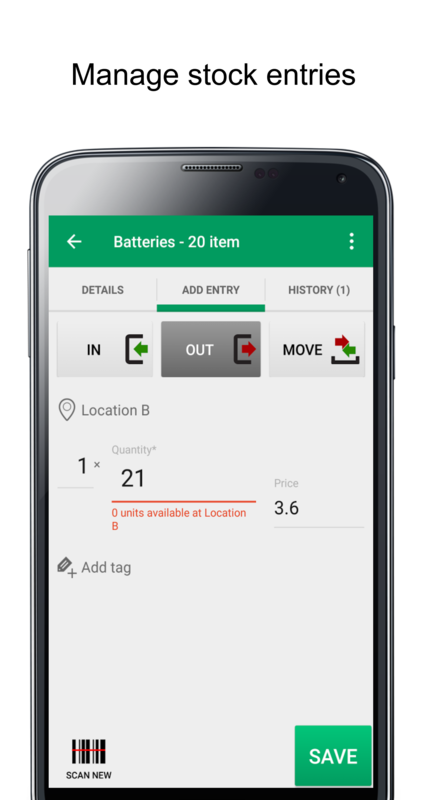 You can filter the products list by locations, tags, collection status (collected, not collected) or category. Also the entries can be filtered by: locations, entry types, entry dates (from ... to ...) and tags. 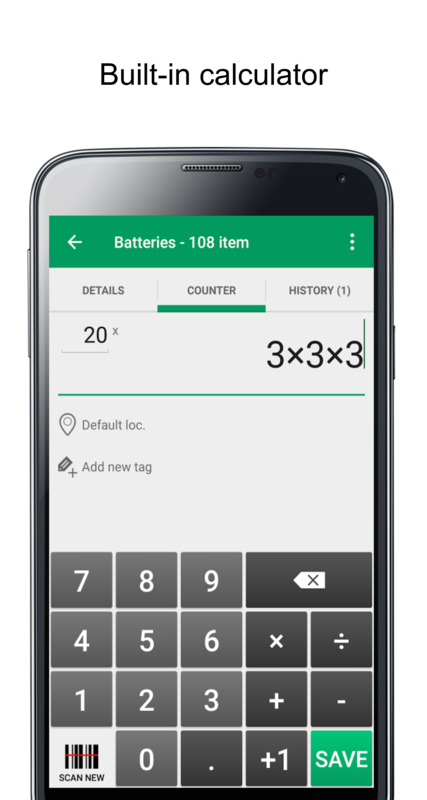 No more additional accessories for any math operations in take inventory process. You have all-in-one here! You can collect quantities in basic measure unit or any batching unit by using the conversion factor. Assign tags to your entries and later filter by them. ex: show all damaged products. 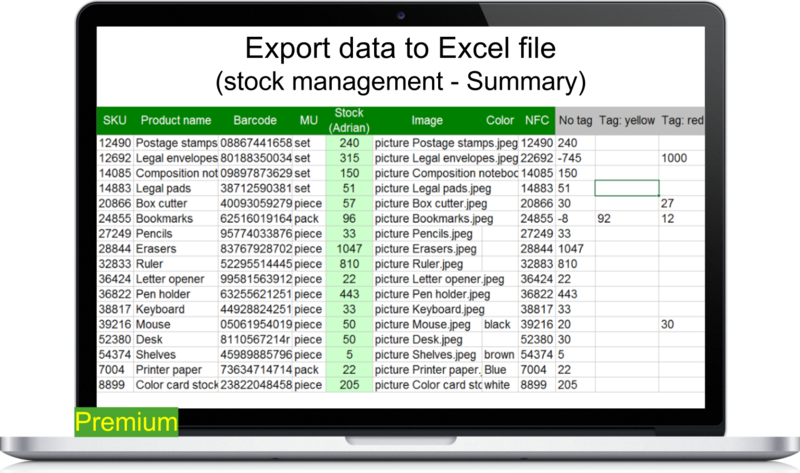 You can add your custom fields and use them in stock management and/or take stock operations. 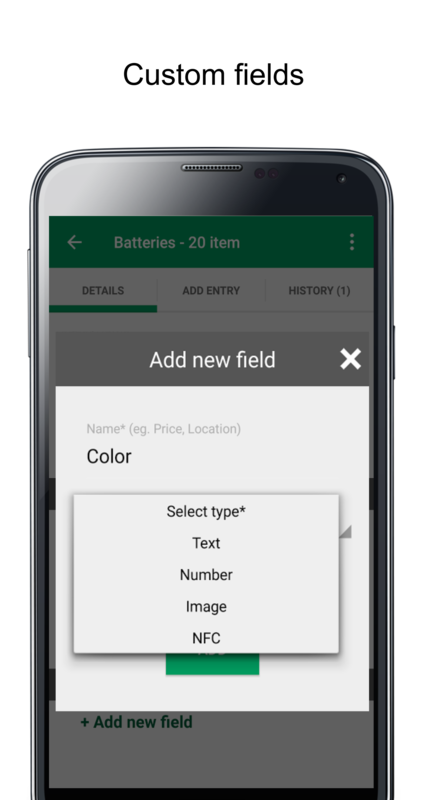 There are 4 types of fields available: Text, Number, Image and NFC - but the list is opened. Each item from the products list contains 6 areas where are placed miscellaneous fields assigned to the product. You have the possibility to define your own combination (add /remove fields, change the order) which can contain custom fields too. When we have many inventory items, much of them with ambiguous and long names, it's hard to do the identification in a short time. In these conditions an image for comparison seems to be a good idea. Sometimes a barcode scanner is a faster reader than the device camera. 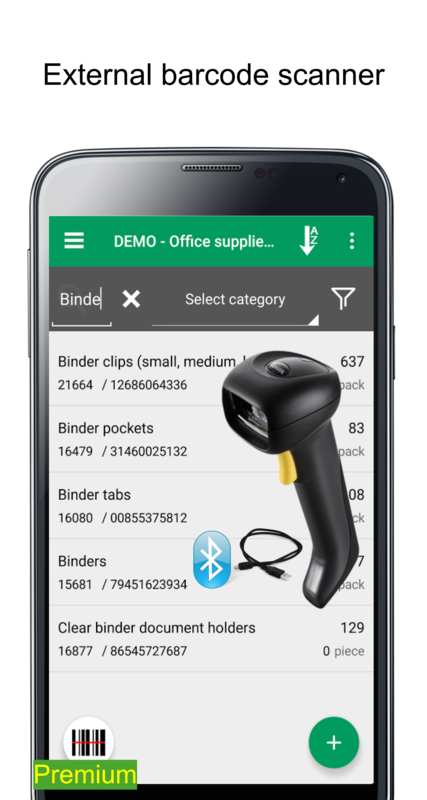 In these cases all you have to do is to connect the barcode scanner to the mobile device via cable / bluetooth technology and start scanning the barcodes. 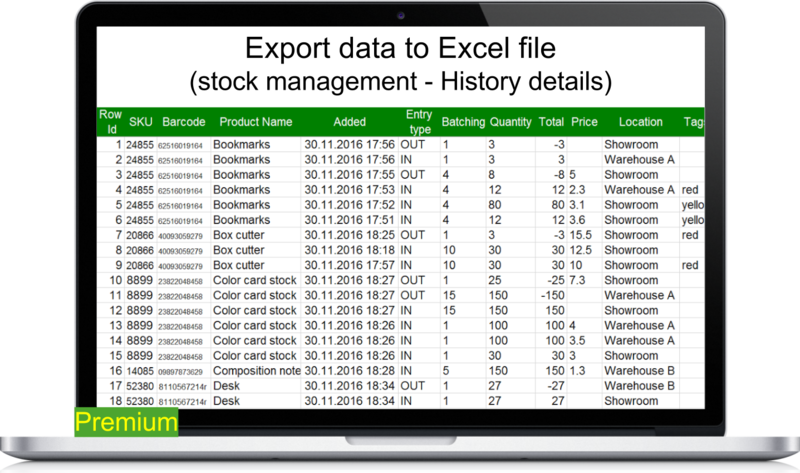 In both cases - Stock management and Take stock - you can export data to excel files which can be saved locally, on drive, shared via email, etc. You need your data to be safely because accidents could happen with your mobile device. We recommend to do time to time backups and save them locally/to your computer/cloud/SD card, etc. 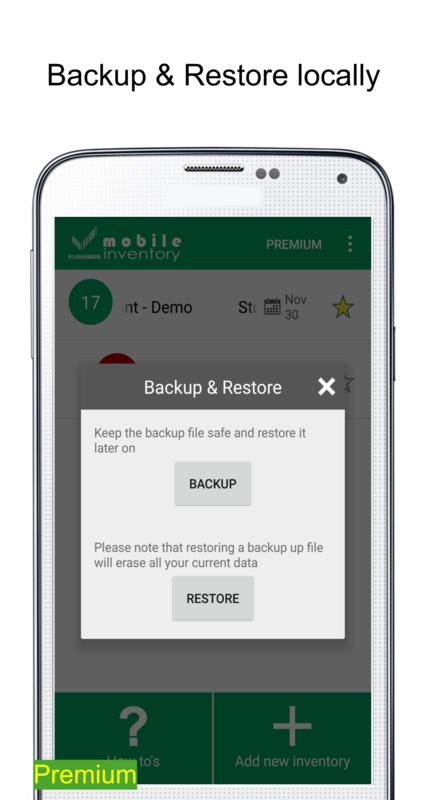 So you can restore all your data in case something wrong happens. If you have an idea, complain or suggestion. Feel free to contact us. © 2018 Bino Solutions, All Rights Reserved.